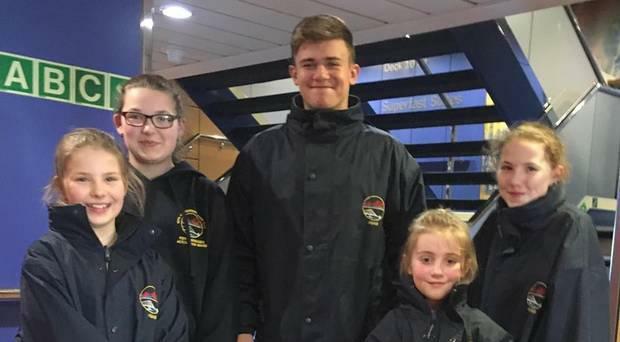 A "young team of heroes" stopped a fellow passenger attempting to jump overboard on a Belfast-bound ferry. Members of the Forth Bridges Accordion Band travelling on the 11.30am crossing from Cairnryan to Belfast on Saturday prevented the female passenger from jumping overboard. Posting on the group's Facebook page, a spokesperson for the band said: "We’re just off the ferry from Cairnryan Scotland to Belfast Northern Ireland. "The quick response from our band member Declan saved the life of a middle aged woman who was about to throw herself overboard, he grabbed her as the young girls ran for assistance. "Declan, Keevay, Korri, Myryn & Hayley we are so proud of you all. Well done to our young team of heroes." Declan Chirray (17), from Falkirk, said he was travelling with the band to take part in a St Patrick's Day Parade in Enniskillen on Sunday. He said the incident happened when he went outside for a smoke with his grandmother when he saw the incident unfolding. "I just sprinted over and grabbed her," he said. A Stenaline spokesman said: “Stena Line can confirm that on the 11.30am crossing from Cairnryan-Belfast this morning (16th March) a female passenger attempted to jump overboard but was restrained by other passengers, who alerted crew to the incident. "The passenger was reunited with her two travelling companions and the group were given a cabin for the remainder of their return journey to Cairnryan.